This has been a week of travel and of meetings for me. It's also been a week of talking about predators and ranching. On Thursday, I participated in a meeting of the UC Ag and Natural Resources Wildlife Work Group at Davis. On Friday, I traveled to Quincy to attend a meeting about ranching in coexistence with wolves. And today, I participated in the 2016 Fibershed Wool Symposium in Point Reyes Station (as part of a producer panel that discussed sheep breeds and husbandry). In the latter two meetings, I renewed friendships with other ranchers - and made some new rancher friends. And as I reflect on my week tonight, I realize that my sense of being part of a ranching community is evolving. 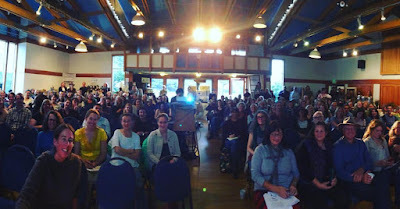 What an incredible crowd at today's Fibershed Wool Symposium! The landscape where we graze our sheep was almost entirely put to agricultural uses in the not-too-distant past. Today, however, the semi-rural land around Auburn is highly fragmented - small farms are interspersed with subdivisions. Our sheep graze almost entirely on leased land - and our winter grazing land isn't contiguous with our summer irrigated pastures. While we can still herd our sheep in some cases, this fragmentation means that we also have to haul our sheep from time to time. Aside from these practical considerations, our disjointed landscape has changed the nature of our relationship to our neighbors. Our home place is the only commercial agricultural operation on our road. Our winter grazing land is within a large-lot subdivision west of Auburn. The landowners for whom we graze are incredibly nice folks - but they have little (if any) understanding of what we do. When Auburn was more of an agricultural community, one's neighbors were more likely to be farmers or ranchers themselves; today, it's vastly different. Sometimes, this lack of shared experience and understanding can have challenging consequences. We've had sheep killed by a neighbor's dog. We've had other neighbors complain about the 2-3 days that all of our sheep are at our home place for shearing. We've had neighbors complain about our livestock guardian dogs barking at night. Yesterday, I learned about a ranching community in southern Alberta, Canada, that is working together to coexist with wolves. Their's is both physical community (that is, their ranches are adjacent to one another) and a human community (they work together to protect their livestock). This kind of community no longer exists where we ranch - our non-ranching neighbors and landlords often have very different perspectives on predators than we do. Some think the only good coyote is a dead coyote (which goes against our commitment to coexistence) - others (as I've mentioned) let their dogs run loose. If (or perhaps, when) wolves become re-established in our region, I worry that we won't have the kind of support network that has allowed these Canadian ranchers to work together to graze cattle without having to kill wolves. Today, however, my optimism was renewed. The majority of the audience during the panel discussion were non-ranchers - and yet they were folks who valued our efforts to raise sheep in a way that fits our environment. Some were urban or suburban dwellers who support our attempts to make at least part of our living from the land. Perhaps more importantly, my sense of being part of a ranching community was renewed. I may not have geographic neighbors who raise sheep, but I'm part of a community of ranchers, nonetheless. In some respects, technology has supported this new idea of community - I had lunch today with group of fellow sheep ranchers, one of whom I had only known previously through our Instagram conversations! I'm realizing that this is, perhaps, the most critical benefit of my #sheep365 project - I've connected with sheep producers all over the world. And despite our lack of geographic connectivity, we are indeed a community. And as with more conventional communities, these connections must be nurtured. Virtual connections (via Facebook, Twitter, Instagram and other social media platforms) have their place, but I remain convinced that face-to-face communication is vital for healthy relationships. Those of us who ate lunch together today, I think, recognize this importance. During the coming months, we hope to get together again - to help one another with our work, to share our ideas and questions - to build community.